As if giving network television a run for its money wasn't enough, Netflix is now gunning for the theater chains. 2016 is shaping up to be a big year for Netflix, to put it mildly. Aside from zooming past the 75 million subscriber mark to start the year, expanding into over 130 new countries, and seeing their share price balloon more than 121 percent since last year, the online streaming service has also been knocking it out of the park with their ever-expanding collection of original television and movie properties. Netflix's first foray into original features, Cary Fukunaga's Beasts of No Nation received massive critical acclaim upon its release and currently holds a 91% "fresh" rating on Rotten Tomatoes. Adam Sandler's Ridiculous 6, despite receiving exactly zero positive reviews, rose to beoame the most viewed movie in Netflix history in less than a month. That's not even to mention how well their original shows like House of Cards, Daredevil, Master of None, Orange is the New Black, or The Unbreakable Kimmy Schmidt have been received, or how great their upcoming Iron Fist and Luke Cage series' are looking. 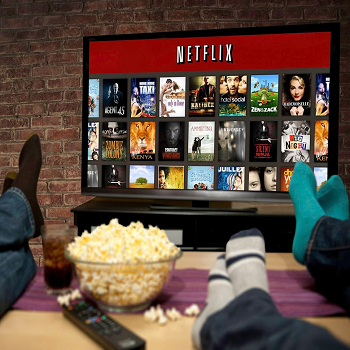 Of course, with their licensed movie catalogue taking a huge hit back in September, Netflix's only obvious solution would be to shift even more towards self-financed features, which recent news seems to indicate will be the case moving forward. "Amateur," to be directed by Sundance Screenwriting Lab alum Ryan Koo, follows a 14-year-old basketball phenom who struggles to fit in with his new team and new coach. Producers are Jason Michael Berman of Mandalay Pictures and Chip Hourihan. "ARQ" is based on an engineer, surrounded by a gang, who must protect a technology that could deliver unlimited energy. Producers are Mason Novick and John Finemore of Lost City alongside Kyle Franke and Nick Spicer of XYZ Films, in association with MXN Entertainment. "Clinical" stars Vinessa Shaw as a psychiatrist who tries to put her life back together after a violent attack. Campfire and Ross Dinerstein are producing. "I Am the Pretty Thing That Lives in the House" stars Ruth Wilson as a nurse hired to care for the author of ghost stories who is living in a home that holds a horrific ghost story of its own. Osgood Perkins directs. Rob Paris' Paris Film Inc. is producing and co-financing with Robert Menzie's Zed Filmworks and Alphonse Ghossein's Go Insane Films. Hazing drama "Underground," directed by Gerard McMurrary, centers on a pledge torn between honoring his code of silence or standing up against the violence of underground hazing. Producers are Stephanie Allain, Jason Michael Berman of Mandalay Pictures, Reginald Hudlin and Mel Jones. And not only that, but it's also being reported that Netflix is planning to adapt Richard K. Morgan's futuristic cyberpunk mystery novel, Altered Carbon, into a series under writer/executive produced Laeta Kalogridis. Joining this incredible lineup will *also* be Paul Rudd's "The Fundamentals of Caring," which Netflix acquired the rights to earlier this month, as well as Ellen Page's "Tallulah" and Crouching Tiger, Hidden Dragon 2: Sword of Destiny, the trailer for which dropped back in December. To quote UFC featherweight champion Conor McGregor, it looks like Netflix isn't here to take part, they're here to take over.